The idea of being green is appealing, but the reality of transforming from an energy hog into an eco-appreciative citizen can be daunting. The trick is to take on one challenge at a time, when and where you can. Here are some green living tips to get you inspired. Soapnuts are an eco-friendly way to clean your laundry, without any fillers, dyes or chemicals. They're hypoallergenic, biodegradable and antimicrobial, too. Buy Laundry Tree Soapnuts natural laundry detergent here. Who says you need water to wash your car? This eco-friendly car wash kit is waterless, nontoxic and costs just a few dollars per wash. Buy Lucky Earth's waterless car wash kit here. Paper plates and plastic cups are synonymous with summer fun, but these aren’t what you think. They’re melamine replicas, so they’re reusable and much more durable. Buy What Is It? Melamine plates and cups here. Carrying your own reusable PeopleTowel instead of wasting countless disposable paper towels can make a big difference in our forests, landfills and waterways. Buy People Towels eco hand towels here. Lighten your laundry load (and your carbon footprint) with this 3-in-1 solution that works as a hamper, a duffel bag and a reusable dry cleaning bag. Buy the Green Garmento, hanging garment and laundry hamper here. This innovative water bottle's design makes it an easy to clean and a safe water bottle choice. Alex is stainless steel, bpa free and unscrews in the middle for easy cleaning. Buy ALEX safe and easy to clean stainless steel water bottles here. Do away with plastic produce bags by using these stylish cotton reusable produce bags from Wonder Thunder instead. Buy Wonder Thunder reusable cotton produce bags here. 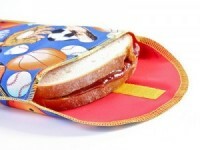 Daily Grommet introduces snackTaxi reusable lunch and sandwich bags. Pretty and durable, these economical bags will help us all do our part to save Mother Earth. Buy snackTAXI reusable snack and sandwich bags here. This eco-friendly reusable "to-go" cup is also stylish! Dishwasher and microvave- safe, its insulated two layers of porcelain keep coffee hot and hands burn-free. Buy I Am Not a Paper Cup reusable coffee cup here. .See more green products ideas here.